You can do lots of things with e-learning including enhancing the existing skills of your team, giving your team new skills, improving productivity, and making your business more efficient. Crucial to all these things is getting a return on investment. 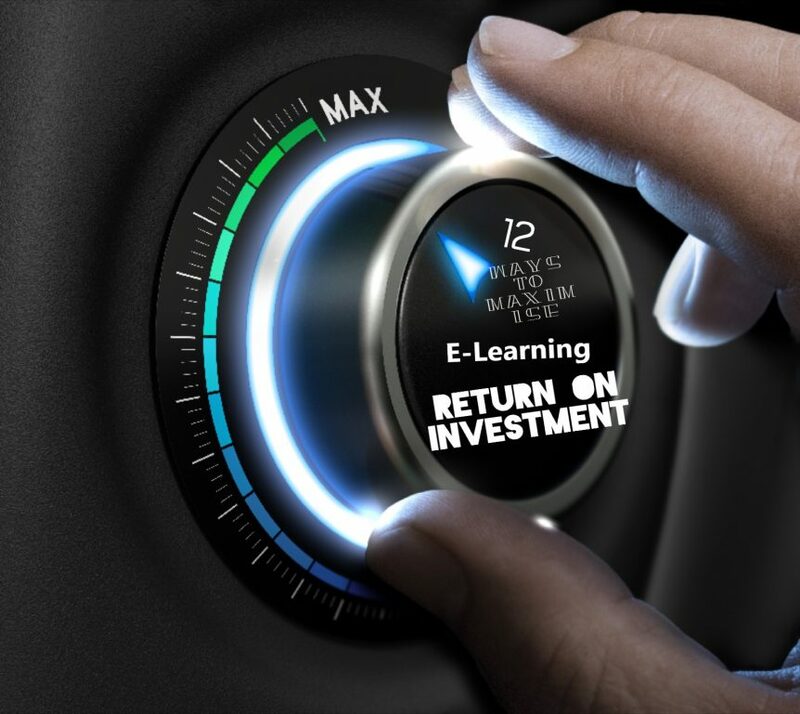 That begs the question: how can you maximise e-learning return on investment? We’ve split our answer into three sections with 12 tips in total. Understand your needs – you first need to understand what you want to achieve with the e-learning courses you are thinking of producing. Some of these were mentioned above but you can add others to the list including giving staff knowledge of a new product, compliance training, improving staff retention, and more. Identify the performance outcomes you want to achieve – once you know what you want to achieve, you’ll need to decide how you are going to measure that success. For example, you could measure productivity improvements by analysing throughput, absenteeism, or error rates. Create a learning culture in your organisation – it is also important that learning is a natural part of the working day/week/month in your organisation. The best way to achieve this is to create a learning culture where continuous professional development is a priority. Use a professional e-learning course developer – courses developed by a specialist e-learning developer will be better technically and they will follow instructional design best practices. This will deliver better results and improved return on investment compared to developing the course in-house. Ensure e-learning course content is relevant – these is a place for generic e-learning courses, particularly in relation to soft skills. For most course topics, however, the course content should be as relevant as possible. This means more than simply relevant to your organisation as you will get better results if you make courses as relevant as possible to individual learners. Ensure your e-learning courses contain elements designed to engage learners – engagement is key in all training. E-learning offers several features that dramatically improve engagement rates and outcomes. These features include gamification elements, scenarios, and quizzes, i.e. anything that gets learners doing rather than reading, watching, or listening. Insist on modular design – there are several benefits to creating e-learning courses in modules. Firstly, it helps you achieve one of the above objectives: making content relevant to individual learners, i.e. you can customise some modules while also having generic modules. Modularising your e-learning courses also helps to make them futureproof as you only have to update individual modules when new information becomes available. Make it easy – the content of your e-learning courses shouldn’t be easy but going through modules and navigating the content should be. This means making the e-learning courses accessible on all devices, keeping modules and sections short, and making all the elements easy to use. Ensure learners understand the benefits to them – you know why the e-learning course is important to your business, but learners should understand the benefits to them too. This could be giving them new skills, making them more efficient at their job, helping them advance their careers, etc. Empower learners – empowering learners is another good way of improving training outcomes and e-learning return on investment. This is difficult with classroom-based training, but with e-learning, you can let learners decide when they complete a course, in what order they go through the content, and more. Measure results – you also need to measure results. This means checking knowledge retention and capabilities immediately after learners complete the course as well as three or six months later. Analyse results in terms of the performance outcomes identified earlier – you also need to measure the performance outcomes you identified earlier, including relating those performance outcomes to the direct results of the e-learning course. This is the step where you will be able to put actual figures on the return you achieved by developing the e-learning course. For example, calculating the cost savings you make as a result of reduced absenteeism or the increased profits you make because of a higher production rate. E-learning offers substantial benefits in many circumstances over traditional methods of delivering training. It’s important you don’t just throw money at e-learning development, however, nor should you approach e-learning without a strategy focused on return on investment. By following the tips above, you will maximise returns.